← Parma Number 47: The Criterion Tavern … when 4 bites of chicken was too much! The Verdict: There were some very good elements of the Oxford 152 chicken parmigiana however it was let down by its side dishes. Cold chips and a bland salad undid all of the excellence that came from the chicken elements of the dish. Chicken Piece: The chicken piece of the Oxford 152 chicken parmigiana was very good. It had been well crumbed and cooked perfectly. It tasted great. Tomato Sauce: As good as the chicken piece was the real hero of this dish was the tomato sauce. 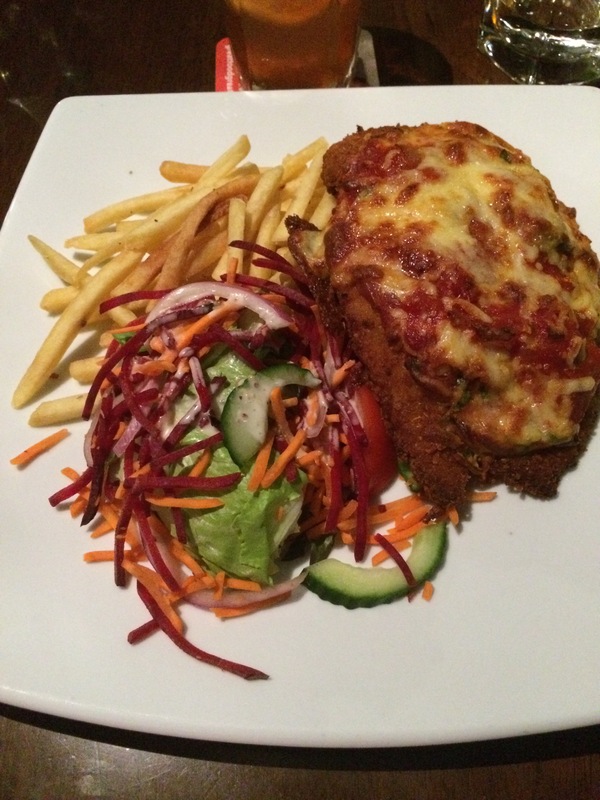 It was one of the best sauces I have had on my search for Brisbane’s Best Parma. Enough said. Ham: The ham was the weakest part of this aspect of this dish. It was quite a thin piece of ham that did not cover the chicken piece. Taste wise it was overpowered by the chicken, sauce and cheese. Cheese: The only weak link of the cheese on this dish was that it did not cover the chicken piece fully. On the positive side it was well melted and tasted great. Side dishes: Unfortunately both aspects of the side dishes were quite weak. The chips, or better put shoestring fries, were cold. I suspect they were not fresh or had been sitting in a hot bay for some time before being plated. The salad was quite bland and could not be saved by the dressing which was quite nice. The Venue: Oxford 152 is on Oxford Street in Bulimba in the inner east of Brisbane. It has a large bar area coupled with a formal (ish) restaurant area with a diverse menu. My chicken parmigiana cost $23. The Final Word: This was a pretty good chicken parmigiana that was let down by the ordinariness of the side dishes and wafer thin piece of ham which is a shame because the other aspects of the meal were really very good. This entry was posted in Uncategorized and tagged Brisbane, brisbane's best, brisbane's best parma, chicken parmigiana, Oxford 152, Parma. Bookmark the permalink.